How can you improve on Oreo cookies? How about giving them a good dunking in rich chocolate?! 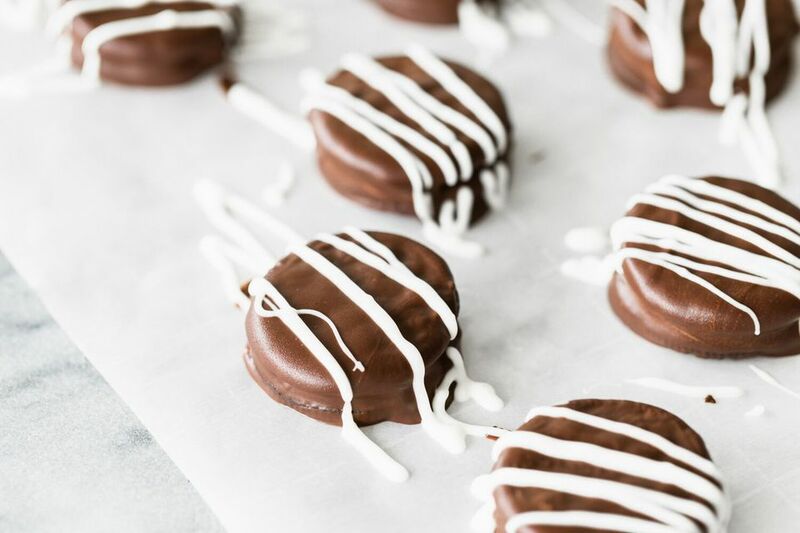 These chocolate-dipped Oreos are super easy, but they're always incredibly popular for one simple reason: they are DELICIOUS. We like to keep things simple and decorate them with a few white chocolate streaks, but you can go crazy with the toppings if you'd like! Place the chocolate candy coating in a medium microwave-safe bowl. Microwave in 30-second increments, stirring after every 30 seconds to prevent overheating until the coating is melted and smooth. Using forks or dipping tools, dip a cookie in the chocolate coating until it's coated completely. Remove it from the coating and let the excess drip back into the bowl, then place it onto a baking sheet lined with parchment or waxed paper. Repeat until all of the cookies are dipped. Melt the white chocolate chips in the microwave, and transfer the melted chocolate to a paper cone or a plastic bag with the tip snipped off. Drizzle the white chocolate in thin lines over the dipped cookies. Alternately, you can sprinkle the cookies with chopped nuts, coconut, small candies, or sprinkles while the chocolate is still wet. Refrigerate the tray to let the chocolate set completely, for about 15 to 20 minutes. Store these chocolate-dipped Oreos in an airtight container at room temperature for up to two weeks. We usually recommend using chocolate candy coating (like Merckens or Wilton's brand) when making these cookies, since the coating is easy to use and the cookies will be shiny and stable at room temperature. If you want to use real chocolate, we recommend tempering it first. If you don't temper the chocolate, the cookies might get soft or melty at warm temperatures, so consider keeping them in the refrigerator if you use untempered chocolate.